Tips On How To Hire A Great Roofer. 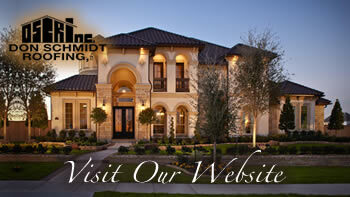 Home » Don Schmidt Roofing Blog » Tips On How To Hire A Great Roofer. Plan: It’s never good for owners to look for a roofer when they’re desperate to get the job done. This will lead to hasty decisions. Instead, owners should be pro-active and decide to replace a roof long before the situation gets bad. Get Referrals: Owners should obtain referrals from friends who are satisfied with the work done on their homes. They should also do an occasional drive-by of a home where the roofer is currently working to get a feel for how thorough a job they’re likely to do. Get Three Written Estimates: Owners should have three roofers come out to measure the roof, inspect the work to be done and provide estimate of cost for labor and materials. The owner should compare those numbers and then make a decision that works best for them. Select A Licensed, Insured Roofer These are all guarantees that the roofer has been certified to the do the job you’re about to hire them to do. Homeowners should hire expert roofers to work on their homes, because even the small damages may be much more serious than what initially appears.